This card uses the fabulous chalkboard art technique. I just adore the fun, playful look. I was inspired by Amy Rohl's pairing of chalkboard plus notebook paper. 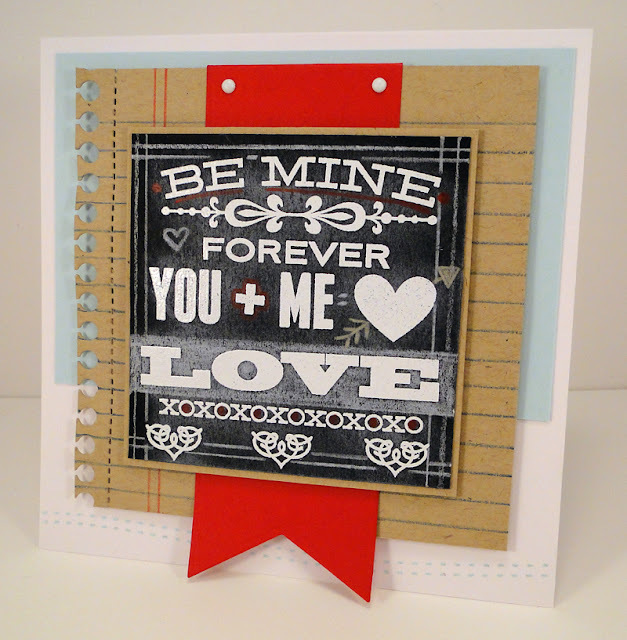 I created my "chalkboard" using Lovey-Dovey Sentiments, Document It - Off the Chart, Lollipop Additions - Love, and Coupon Book - Love. I tucked a Wild Cherry Fishtail Flag under the chalkboard panel. I created a piece of notebook paper on Kraft card stock using the Notebook Edge Die-namics and red and blue Prismacolor pencils. I simply used a ruler and grid paper to help me line up all the lines. I wanted to pull in the colored pencil detail from the chalkboard to another layer of the card. Along the bottom of the card base, I included a border stamp from Hearts and Stitches, stamped in Sno Cone ink. I tucked in a panel of Sno Cone card stock to add a little subtle pizazz. Ready to go shopping? Click the banner below or click HERE to purchase any of the Brand Spankin' New products. Be sure to visit the MFT Blog for a complete linked list of MFT Designers participating in tonight's New Product Tour. You'll see each and every product being released in action and have one last chance to view everything before you go fill your cart with MFT goodness. Here are all the products I used to create my card. Love your chalkboard!! Thanks for the party tonight! Jody - So wonderful. I love all your fabulous touches. Beautiful JOdy - I love the chalkboard look!! Thanks for everything this week - your work is appreciated!! Oh my gosh, Jody, so so so cool! You hit it, girl!! 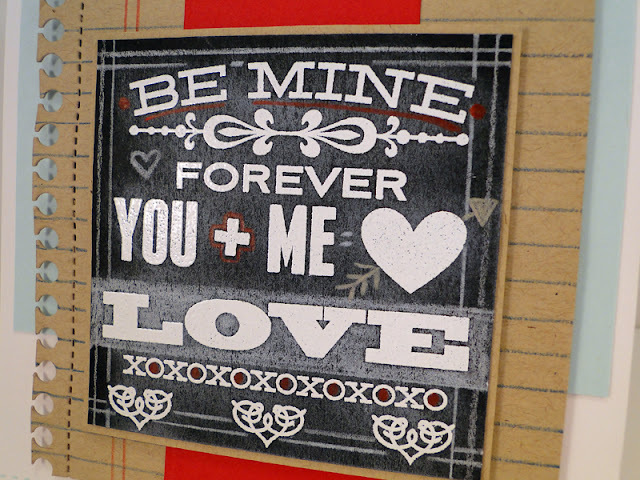 Super cute chalkboard card. Love the little bit of red with the words and the bright red banner tag. Great job on the chalk board technique. The red banner really makes it pop! Very cute, love the chalkboard technique. 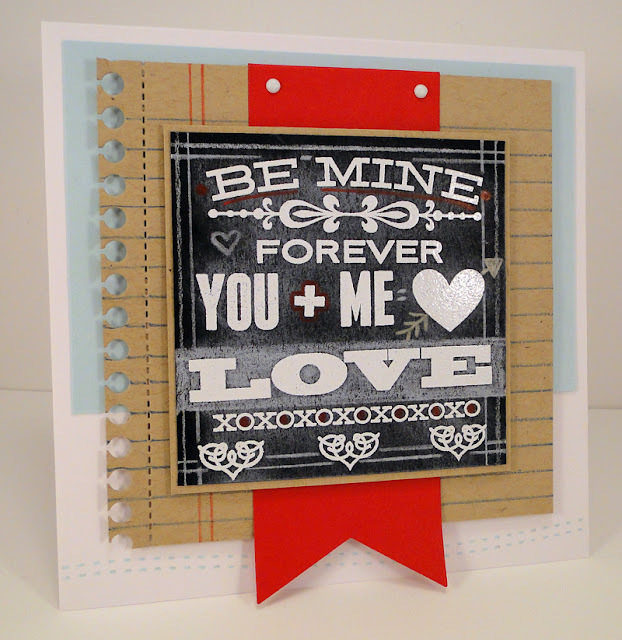 this is a fabulous chalboard card and the new products are perfect for this technique-love it!! Great combination of images & colors--terrific card! I've become a huge fan of the chalkboard technique used on your card so beautifully. The Lovey-Dovey stamp set is on my "need" list! That chalkboard technique is cool! Thanks for sharing a wonderful card showcasing it!! Too cute! I love the chalkboard look! Love the Chalk Board effect, this is so cute. I am loving all the chalkboard cards I've been seeing. Yours is fantastic! I love the piece of notebook paper you created! What a fantastic detail! So clever as usual!!! Love the chalkboard...thank you so much for sharing! Gorgeous card! I love the chalkboard technique and you added the perfect touches with the red! Love all you examples. Thanks for a fun release night! You rock. Great card! I do like the notebook paper under the chalkboard. So cute! Such a great card! Great job! Absolutely adore the Kraft and chalkboard effect, great card ! Love the card! Was never a big fan of the chalkboard cards, but you guys have done a fab job convincing me! Ack!!! AWESOME job with the chalkboard technique!!! LOVE LOVE LOVE!!! LOVE it, Jody!! it turned out beautifully. I just adore the red, kraft, and black combo! 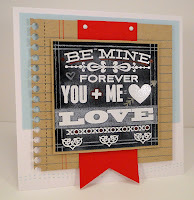 Love the new Hearts and Stitches stamp set! Especially the little jotted wavy lines. Tons of uses! Beautiful color combo, wonderful card and design. Love the chalkboard look. The white embossing really makes these pop...I love this! So fabulous! I love the chalkboard look! I just love the chalkboard technique, I think it is my new favorite why to make cards! Super great card! wow stunning love the chalkboard look. so stinkin cute! I adore this! This has been an exciting release, I love all your work. Thanks for sharing. This looks great with the notebook paper. Awesome card! 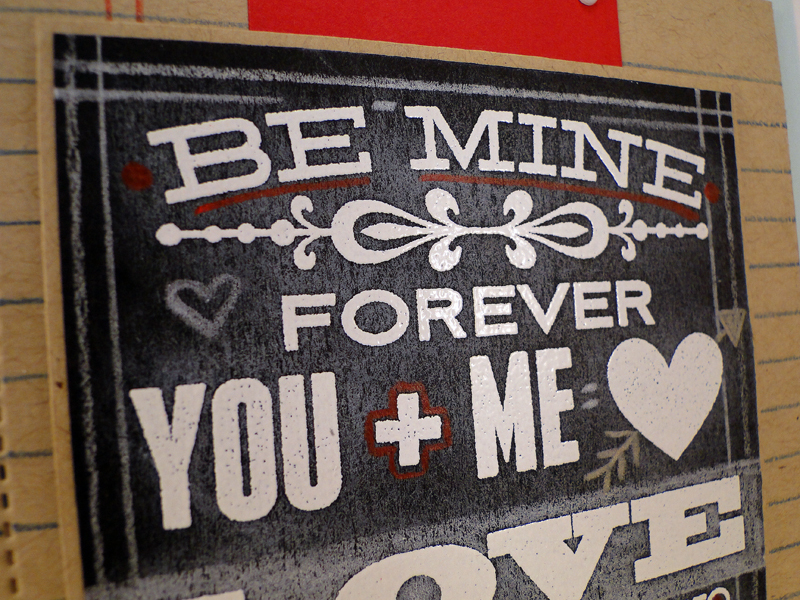 I love the chalkboard sentiment with the kraft notebook paper. This is so beautiful. I love the chalkboard technique. 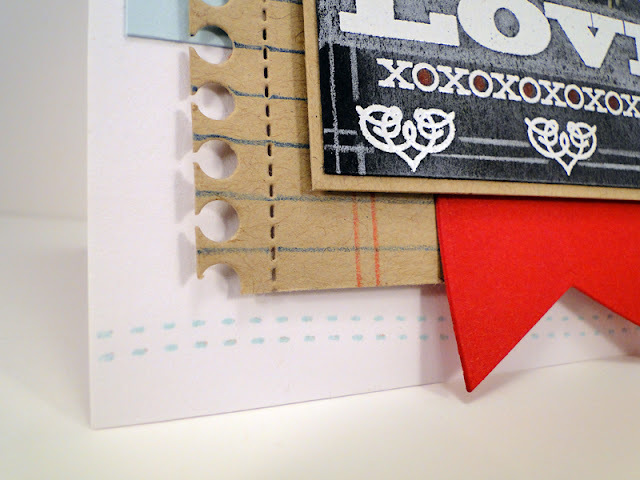 The Notebook Edge die looks fabulous on kraft. Wow! 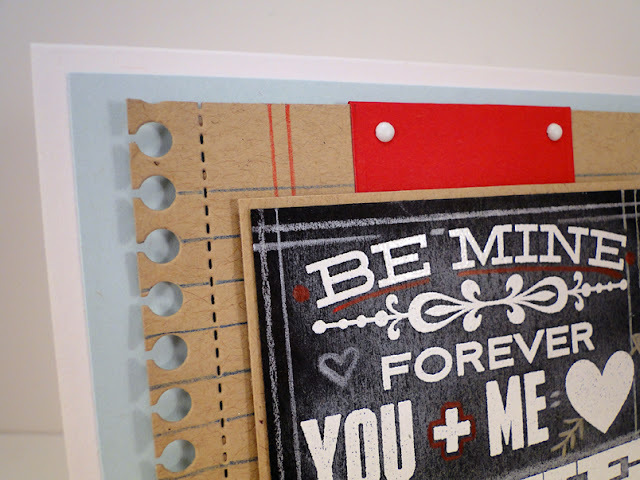 This is a FABULOUS "chalkboard" card! Love your erased chalk look! So cute. Love the chalkboard. Fun technique, I love the touch of red! Sweet card! Love the chalkboard look! This is amazing Jody!! Great CAS card! Love the layers! Wow! This is so pretty Jody! I love the chalkboard technique! Thanks for the inspiration!